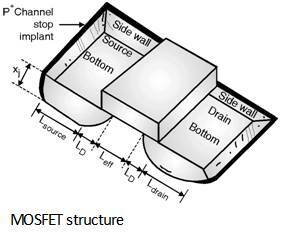 The gate capacitance (Cg) is decomposed into two elements each with different behaviour, one part of Cg contributes to the channel charge and another part is due to the MOS structure. The channel charge capacitance is derived from the gate to channel capacitance CGC which consists of, 1) gate to source (CGCS), 2) gate to drain (CGCD), and 3) gate to Body (C GCB) capacitances. These capacitances are depend upon the operation region and terminal voltages. When the transistor is in the cut-off region no channel exists and CGC appears between gate and body. In the linear region an inversion layer is formed which acts as a conductor between source and drain. Hence CGCB = 0 as the body electrode is shielded from the gate by the channel and by using the symmetry the total capacitance CGC is distributed evenly between source and drain. In the saturation mode the channel is pinched off hence the capacitance between gate and drain is CGCD = 0 as well as the capacitance between gate and body i.e. CGCB = 0 therefore the total capacitance CGC is represented by the gate to source capacitance CGCS. Once the transistor is ON the distribution of its gate capacitance depends upon the degree of saturation measured by the ratio . 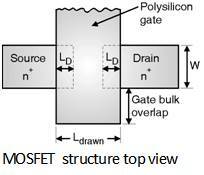 Consider the structure of MOS transistor shown in Figure below. Ideally the source and drain diffusion should end right at the edge of the gate oxide. The average distribution of all the gate capacitance in cut-off, linear and saturation region of operation is given in Table below. The diffusion capacitance also called as junction capacitance is contributed by the reverse biased source-body and drain-body pn junctions. 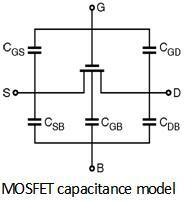 This type of junction capacitance is non linear and decreases when the reverse bias is increased. Figure below. 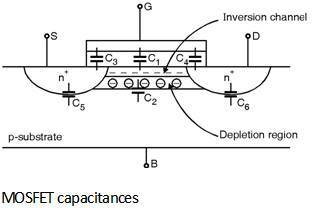 The diffusion capacitance also includes the capacitances due to bottom plate junction and side wall junctions. Where Cj is the junction capacitance per unit area. Thus for designing high performance and low energy circuits to this model is strongly required.